Promoters take note, always been searching for that unique spin to give your budding club night that unique twist, well Red Bull Revolutions in Sound have taken it to a whole new level by hiring the iconic ‘London Eye’ and hosting 30 simultaneous club nights, each with their own pod. This event is celebrating those innovators who have stepped out against the flow and forcible changed the course of electronic music and clubbing . Over the next few weeks we will be delving a little deeper into the philosophy, passions and motivations of clubbings game changers. So far we’ve had ‘London Warehouse Events‘ // ‘Jah Shaka Sound‘ // ‘Metalheadz‘ // ‘Cream‘ // ‘Sub Soul‘ // ‘Lost‘ // ‘Corsica Studios‘ and ‘FAC51 The Hacienda‘. 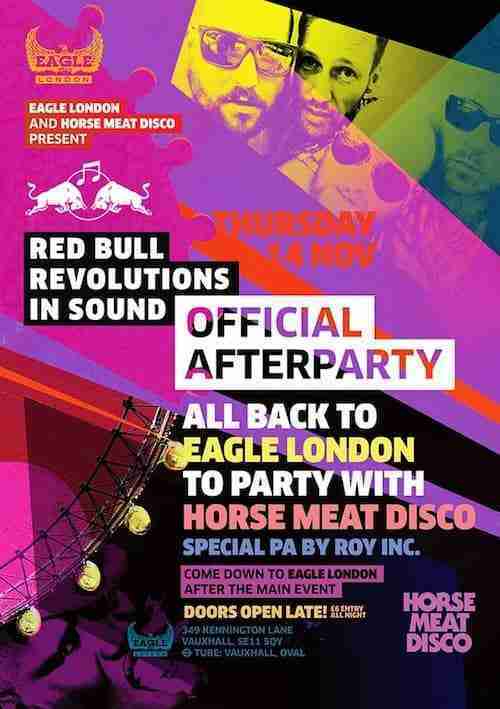 Next up ‘The Eagle’ owner talks Horse Meat Disco, managing promoters expectations, wearing anorak’s and designer drugs…..
James Murphy, Maurice Fulton and Daniel Wang are just some of the dance music luminaries who’ve turned out at the Eagle, found in south London’s busy Vauxhall. But the spot’s reputation for shimmery New York disco and cutting edge Italo is mostly down to Horse Meat Disco, the DJ collective formed of Jim Stanton, James Hillard, Luke Howard and Severino. BBB: What was it that inspired you to enter the unpredictable world of putting on parties, and why do you think ‘The Eagle’ became such an iconic clubbing brand? After working within Television and International Marketing for 20 years, I was given the opportunity to get involved in the creation of a New Business Venture and purchase some run down London boozer and create a new destination for people to enjoy and where we could enjoy somewhere that would play the type of music that no one was playing at that time and that us and our friends wanted to hear. After seeing ‘Horse Meat Disco’ for the first time, it was instant that this is where we would be going, and a 10 year journey was started from that one visit. The biggest challenges that face venues and promoters is keeping an event fresh and current, listen to your customers. listen to your team, managing your promoters expectations are very important especially when it comes to venue capabilities. EVERY promoter wants to have their music as loud as possible with little or no understanding (or care) for your local situation. Working in partnership with your promoters is key to building a long term relationship where both parties trust and respect each other. At The Eagle London, each of our flagship events have just celebrated 10 years at the top of their respected game, after such a time together we have been able to take advantage of changing trends and fashions as our customers have grown with us. I moved into the club and party world from 2o years of working in high pressured television and multi media marketing, if the Eagle London venture had not been successful I would concentrate on my other business which is trading in antique toys or working as a bus conductor on the new bus for London (Anorak Warning). As access to music has evolved and people have become so much more music savvy, their is and always will be a desire to experience their choice of music in a suitable venue bar or club either on their own, to meet new friends, or with groups to create a party. 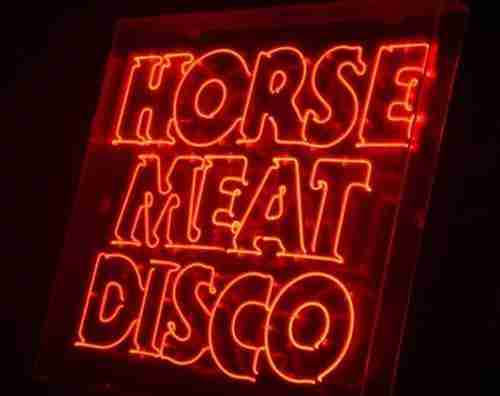 This is why Horse Meat Disco has been able to continue its weekly residency by constantly introducing new sounds, new and classic DJs and a host of impromptu acts or guests which all add to the experience of a great night out. I would like to see the eradication of a host of ‘designer’ drugs and potions which a small minority partake, but cause a majority of hassle and trouble. The BINGE SOCIETY perception of clubbing and night time entertainment must be changed before changes are brought that will change clubbing forever. If I could raise one piece of Clubbing Nostalgia it would be the opening night of SPECTRUM at Heaven Night Club in the late 80s, I was working in the club at the time when a young Paul Okenfold took to the then haloed decks of the infamous Gay Super Club hidden away in the depths of Charring Cross Station, and on a Monday night 3000 ravers took over the club until the early (Californian) Sunrise the next day, and many of the ravers carried on dancing in Charing Cross Station sporting home made Smiley T Shirts and Day-Glo Head bands. Sadly a victim of its mega success and the heavy handed drug raid that was the end of that particular event, but the start of a new generation of clubbers and club kids.